Thousands of civil servants, teachers and rail workers have taken to the streets of Paris in order to protest against President Emmanuel Macron's reforms; the peaceful rallies have escalated into unrest, with demonstrators smashing shop windows and engaging in violent clashes with police. French police used tear gas against high school students who took to the streets of Paris on Thursday to protest against the government's planned education reforms, a Sputnik correspondent reported from the scene. Hundreds of protesters started marching from Place de la Nation in Paris earlier on Thursday, the day of planned public service protests across France. Some of them were wearing masks. The protesters were shouting slogans, and at one point started throwing stones and bottles at police, prompting officers to use tear gas. Demonstrators were reported to be attacking journalists. Ambulances have been spotted on the scene. At least one protester sustained injuries to their face, the Sputnik correspondent reported. It is planned to hold about 180 demonstrations in over 150 French cities and towns. The nationwide general strike will hit the country's rail services, as about 60 percent of trains are set to be disrupted, as well as airports, with 30 percent of flights set to be cancelled in Paris. Many daycare centers, schools and hospitals are also likely to be affected since teachers and health workers are joining the protests. 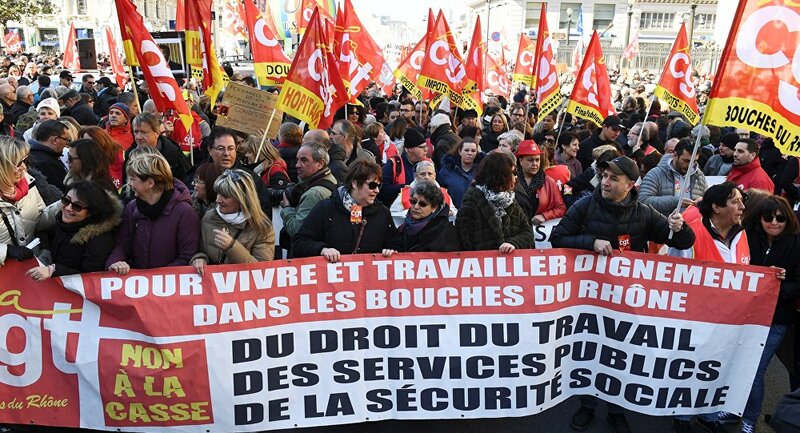 Seven public sector trade unions, including the French General Confederation of Labour (CGT), Workers' Force (FO), French Confederation of Christian Workers (CFTC), called a strike on Thursday. Thus, public workers are taking to the streets to demand the abolition of unpaid leave and protest the announced elimination of about 120,000 jobs in the public sector, while air traffic controllers call for a rise in pay and additional personnel. The reasons behind the protests of university and college professors also include the demand for the increase in staff. They claim that some 3,800 extra jobs promised by the beginning of next school year is not enough to implement the educational reform. One in four teachers are on strike Thursday, while students in the French cities of Paris, Caen and Montpellier blocked several colleges, denouncing the university access reform and changes to the baccalaureate exam (the country's school-leaving exam). The RATP workers (Paris metro operator) are also on strike to show their solidarity with the railroaders, who are fighting against the government taking away their special status and opening the French railway market for new companies. Protesters gathering in various French cities carried posters saying "Sorry for the inconvenience, we’re trying to save our future." The days of strikes are not paid neither in the public nor in the private sector. Some trade unions, like CFDT or CGT, raise funds to pay the employees a compensation for manifestation days.